[14:46] <+GenoFoxx> Yohann, Neko (I asume Neko is Valerie) could you introduce yourselves and your game? [14:47] <+Dan1> Yup, please do! [14:50] <+Neko> Are you the Davidalpha we know? French, right? [14:54] <+GenoFoxx> What is is Shayo about? [14:54] <+Neko> Shayô is a post-apocalyptic game with a japanese setting, to sum up. [14:55] <+Neko> Japan came back to a feudal government and way of life. [14:56] <+GenoFoxx> So Thundarr the barbarian by way of Shogun? [15:00] <+GenoFoxx> how much of Japan is left or did the waters recede? [15:01] <+Neko> No it didn’t, so the bigger cities are under water, now. [15:01] <+Yohann> do you want to see a map? [15:02] <+Yohann> Did it work ? 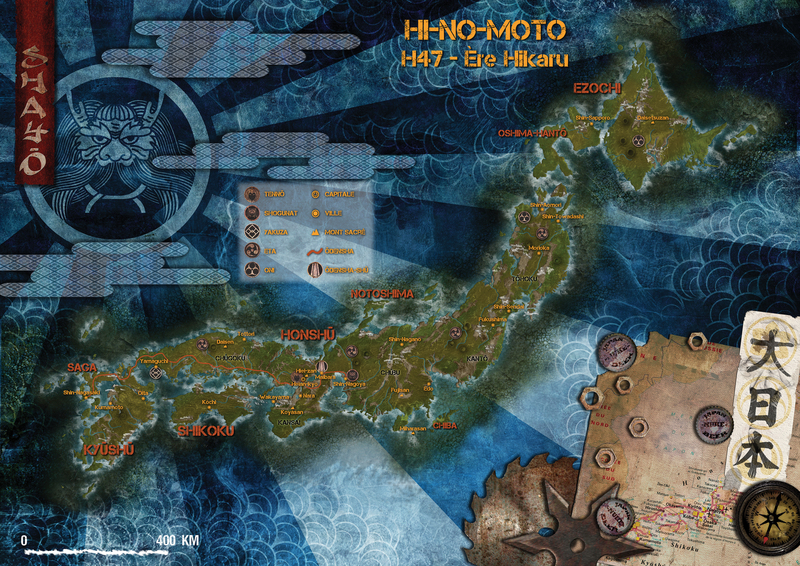 [15:04] <+Neko> Japan is no more, it’s called Hi-no-moto, the ancient way to pronounce the same word. [15:05] <+Neko> Yes, Greg is very good. He made the character sheets too. [15:05] <+Yohann> yup, let me find it. [15:06] <+GenoFoxx> Has Hi-no-moto returned to being isolationist? [15:07] <+Neko> So it’s quite impossible for them to leave Hi-no-moto anyway. [14:08] <+Meyrana> my question is : you say Hi no moto is isolated but I recall reading something about a foreign invasion ? [14:08] <+Neko> A long time ago. [14:09] <~Dan> (GenoFoxx, are you able to save the previous part of the log? [14:09] <+Meyrana> Then, another question please ? [14:09] <+Neko> We don’t give an exact date (we’ll do later) because the inhabitants don’t remember. [14:10] <+Meyrana> Do you have any time scale to help understand the technology and cultural gap ? [14:10] <+Neko> People living in Hi-no-moto don’t remember. [14:10] <+Neko> You can’t know that. [14:11] <+Neko> How could they remember, without any book..nothing left. [14:11] <+Meyrana> yes but this means it’s been several generations since the Tenbatsu, right ? [14:12] <+Meyrana> Ok, that was my guess 🙂 Thank you ! [14:12] <+Neko> I think you may think it was around 200 years ago. [14:12] <~Dan> Are there mutants in the setting? [14:12] <+Neko> You may…. :) If it helps you. [14:13] <~Dan> How extravagant are mutations? [14:14] <+TheDreadGazebo> will this game be using the same system as keltia/yggdrasil? [14:14] <+Neko> Well, you may have slight deformities or very obvious. [14:15] <~Dan> Are there any really gonzo mutations, like laserbeam eyes? [14:15] <+Neko> But please, you may create some… Funny. [14:16] <+Neko> The system is a variation on Roll and keep. [14:16] <+Neko> You throw as many dice as your level in Attributes and you keep only the level in Skills. [14:17] <+TheDreadGazebo> which is the same system used in keltia, or am I remembering it wrong? [14:22] <+Meyrana> What is Instinct for ? [14:22] <+Meyrana> Does it serv as a scenaristic helper ? [14:26] <+Neko> They pray “Kami” and “Enlightened” and Spirits. [14:26] <~Dan> Are there supernatural creatures in the setting? [14:27] <+Neko> There are Onis and many different weird creatures. [14:27] <~Dan> What are they like? [14:28] <+Neko> Or very very cute small animals, chewing you in your sleep : Momoga. [14:29] <~Dan> Looks pretty nasty. [14:29] <+Yohann> remeber when I said that villages and communities are also isolated ? [14:30] <+Neko> It’s very important. [14:31] <~Dan> How obviously supernatural are the oni? Is it possible that they’re mutants of some sort, or are they too outlandish even for that explanation? [14:31] <+Meyrana> I particularly love the fact that each character has his own “village” setting but I quite don’t get how you actually use that during the game. Can you please give an example ? [14:31] <~Dan> Can you give some examples of their powers? [14:33] <+Neko> And you may buy NPC’s with that. [14:34] <+Meyrana> ooooh ! Okay ! [14:37] <+Neko> You mean PCs or mutants ? [14:37] <+Neko> PCs belongs to the same village. [14:38] <+Neko> That helps creating a group too. [14:38] <~Dan> Is it common for villages to have samurai in residence? [14:40] <+Neko> They may be protected by Yakuzas too. [14:40] <+Neko> You have to pay taxes. [14:41] <~Dan> How common are monsters? [14:41] <~Dan> So they’ll kill you if you try to commit suicide? [14:42] <~Dan> Too few people left? [14:42] <+Yohann> yeah, life is precious. [14:44] <+Neko> But they’re not really aware of that number. [14:45] <+Neko> And the country is very dangerous. Many animals suffered mutations too. [14:45] <+Meyrana> Since Women can have former men’s roles, how does it fit with the traditionnal cultural model of Hi no moto ? [14:46] <~Dan> Ocean fish are poisonous? [14:46] <~Dan> Or all dead? [14:46] <+Neko> Well, the Tennô decided all that? [14:46] <+Neko> With no reference books, they just obeyed. [14:46] <+Neko> On what the Tennô told them it was. [14:47] <+Yohann> Dan Yeah !! [14:47] <+Neko> But you have inner seas and lakes. [14:48] <+Meyrana> Oh gosh, men as geishas ? 😀 I want one at my table ! [14:48] <+Neko> A geisha means only artist. [14:49] <+Yohann> I had a male player playing a male geisha (he had even brought Japanese fans and a kimono to play). That was utterly awesome ! [14:50] <~Dan> So what are kaiju like in this setting? 300′ tall radiation-breathing monsters? [14:52] <+Neko> not too much… Sharkzilla is a good one. [14:53] <+Neko> It’s a great character to play. [14:53] <~Dan> I think an earlier question of mine got lost… Can you describe some of the powers of the oni? [14:55] <~Dan> Speaking of which, can you say a bit about how spells work and how powerful they can be? [14:55] <+Neko> You have 4 spell lists. [14:57] <+Neko> You concentrate and you use one of the Attributes. [14:57] <+Meyrana> Is there some kind of magical alchemy like there was in Qin ? [14:59] <~Dan> Radioactive slop = magic!! [15:00] <~Dan> Was society at the current tech level before the disaster? [15:00] <~Dan> It’s not what? [15:01] <+Neko> Not our current tech level. [15:01] <~Dan> Was it more advance, then? [15:04] <+Neko> There is a sect worshipping the train. [15:04] <~Dan> Do they practice trainscendental meditation? [15:05] <+Neko> Close to the Guysha ? [15:07] <~Dan> Will the core book contain a bestiary, and if so, how extensive will it be? [15:10] <+Neko> Humans are very important opponents. [15:10] <+Neko> But monsters are far more dangerous. [15:11] <+Yohann> People can develop mutations at any time during their life. [15:14] <~Dan> Are there areas that are still dangerously radioactive? [15:15] <~Dan> What do people believe them to be? Cursed lands? [15:15] <~Dan> Lots of mutated freaked around such places? [15:16] <~Dan> That sounds unwholesome. [15:17] <+Neko> Hi-no-moto may be a very hostile place. [15:18] <~Dan> What sorts of adventures do PCs have in the setting? [15:21] <+Neko> Yeah.. Damn, I’m a shinobi..
[15:24] <+Yohann> Oh absolutely !! [15:28] <+Neko> In France, I mean. [15:29] <+Yohann> And the screen is absolutely beautiful ! [15:29] <+Neko> Did you see the screen Meyrana? [15:32] <+Neko> Like all our game lines, Shayô will have a screen and four sourcebooks including a campaign. [15:33] <+Neko> Only the ones practicing trainscendental meditation…. [15:34] <+Meyrana> I’m soooo loving the visuals of this game ! [15:34] <~Dan> Oh, when does the Kickstarter begin? [15:36] <+Neko> Thanks a lot Meyrana. Hope you will enjoy the campaign too. [15:36] <~Dan> Thanks very much for joining us, Yohann and Neko! [15:37] <~Dan> You’re always welcome! [15:37] <~Dan> I’ll get the log posted when I get home this evening and send you the link. [15:38] <+Neko> We’re very happy to introduce our brand new game here! [15:38] <~Dan> Please come by any time you like!